First-aid is the administering of emergency care for injury or illness before emergency medical service (EMS) becomes available. The Occupational Safety and Health Administration (OSHA) requires employers to have someone, or multiple people, trained in first-aid for worksites that are not in close proximity to a hospital, clinic, or infirmary. While OSHA has certain standards and requirements, many aspects of the program are flexible and left to the discretion of employers. Therefore, OSHA provides a guide to summarize the fundamentals of a first aid program. The basic elements of the program include identifying and assessing risks in the workplace; designing and implementing a first-aid program that complies with OSHA requirements to mitigate accidents or exposures; instructing employees about the first-aid program; and evaluating and modifying the program to fit current needs. Under the OSHA First Aid standard (29 CFR 1910.151), all workplaces are required to have trained first-aid providers if there is no infirmary, clinic, or hospital nearby. Additionally, OSHA requires training in cardiopulmonary resuscitation (CPR) because cardiac arrest can occur in the workplace from asphyxiation, electrocution, or exertion. The American Heart Association estimated that there are 250,000 cases of sudden cardiac arrest outside of hospitals annually. Administering CPR can keep a victim alive until EMS arrives. After an employer’s program is compliant with requirements, OSHA suggests that the employer assess the risks and design a program specific to the workplace. Employers can use records such as the OSHA forms 300 and 301, Workers’ Compensation insurance carrier reports, or other records to identify first-aid needs. More, employers should attempt to estimate EMS response times for every time of day and night that employees are on duty. This information can assist with the planning of a first-aid program. All policies and procedures for the program should be communicated clearly in writing to staff. 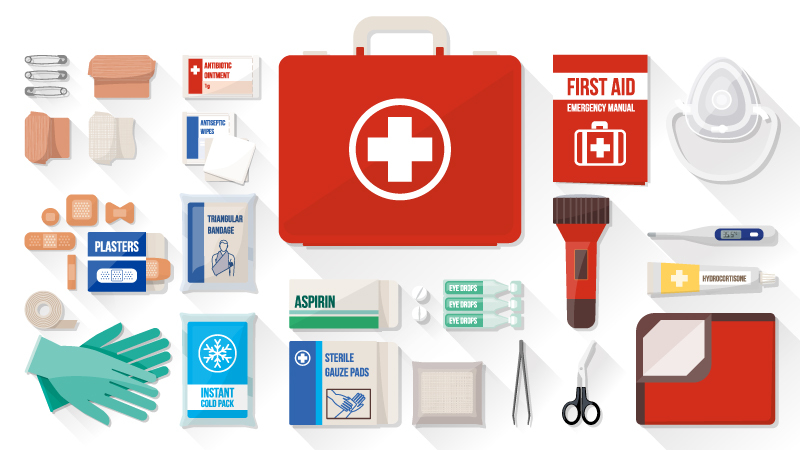 The responsibility for choosing and maintaining the first-aid supplies should be given to one person. The supplies must reflect the injuries that could occur in the workplace and must be stored in an easily accessible area. When selecting first-aid supplies, an automated external defibrillator (AED) should be considered as well. Employers should continually reassess the supplies and update them as needed. The next step in a first-aid program is training employees in first-aid. Training programs are offered by many organizations, such as the American Heart Association, the American Red Cross, the National Safety Council, and other educational organizations. The training course should be personalized to the needs of the workplace. learning the importance of precautions, such as body substance isolation to protect from bloodborne pathogens and other infectious materials. providing methods for safely moving and rescuing victims and repositioning victims to prevent further injury. responding to other medical emergencies such as chest pain, stroke, breathing problems, seizures, impaled object, pregnancy complications, and more. The fifth and final element of the training program involves responding to non-life-threatening emergencies. The training program should include instruction on wounds, burns, temperature extremes, musculoskeletal injuries, eye injuries, mouth and teeth injuries, and bites and stings. First-aid care is critical in any workplace. It is suggested that for CPR or the use of AED, skills be reviewed and practiced at least every six months. Retraining for responding to life-threatening emergencies should occur at least once a year and retraining for non-life-threatening emergency response should occur periodically. The first-aid program and supplies should be reviewed constantly to ensure that it continues to address the needs of the workplace. The First Healthcare Compliance cloud-based software solution creates confidence among compliance professionals through education, resources, and support in the areas of HIPAA, OSHA, human resources compliance, and fraud waste and abuse laws. Visit our website to learn more about our comprehensive compliance management solution for healthcare providers and explore our blogs for more information on OSHA.